win tickets to pizza klatch’s gayla feature performer!! Pizza Klatch, a local organization who provide support for our LGBTQ+Youth, is getting ready for their annual fundraiser, the Slice of the Good Life Gayla, on February 3rd. This year, Grammy nominee Mary Lambert, will be the featured performer and we want to give away two tickets! The reception begins at 5:30 pm in the Black Box at the Washington Center for the Performing Arts, including fabulous appetizers, wine, beer, and a Pizza Klatch Signature Cocktail. 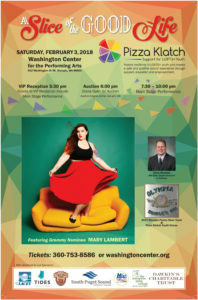 Mary Lambert will share a few words before the charity auction, and then you’ll enjoy the main show from the best seats in the house.